The recently published Economist Intelligence Unit’s Democracy Index for 2018 rated Morocco 100 out of 165 countries, and third in the MENA region, after Israel and Tunisia. The Index covers “almost” the entire world population and is based on five categories: electoral process and pluralism, civil liberties, the functioning of government political participation, and political culture. In the report, political participation was the only one of the five criteria to show a gain from the previous year, an index that began in 2006. Only one country, Costa Rica, rose from a “Flawed Democracy” to “Full Democracy”. And one country, Nicaragua, moved in the opposite direction, from “Flawed Regime” to “Authoritarian Regime.” The US remained a “Flawed Democracy,” with its overall score slightly declining from the year before, from 7.98 to 7.96. Canada performed better from the year before and is considered a Full Democracy. 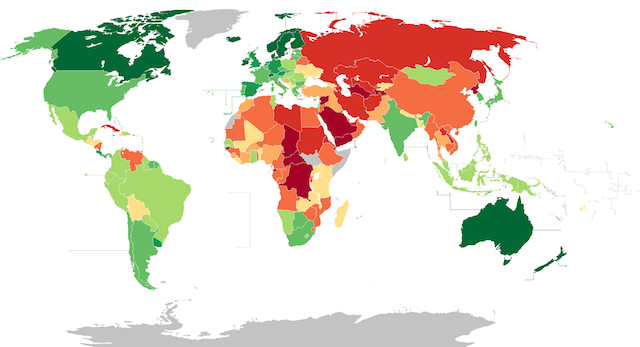 It was rated 6th best democracy in the world and the US was ranked 25th. Norway, Iceland and Sweden topped the overall list of this year’s Index. There were substantial declines in the rankings of several countries, including Italy, Turkey and Russia. The North American region retained the highest overall scores, followed by Europe. With this rather rigid criteria and strict methodology, Morocco continues steadily and surely on the road to democracy.